Most people take pride in taking care of their vehicles. This applies to a car’s mechanics and its physical exterior. Wear and tear on your car may make it difficult to keep everything in perfect shape, especially when it comes to your tires and rims. Tires and rims receive the brunt of the damage, but there are ways to combat this dirt and grime. Use these tips from the expert team at CarRegistrationAdvisors.org to keep your tires and rims clean, on and off the road. Cleaning your tires and rims requires a bit of manpower and the right tools to get the job done. There is a wide range of brushes available to clean your wheels, but make sure you are using the right tools for the job. It is important to have different cleaning brushes for various parts of your vehicle. The experts at CarRegistrationAdvisors.org know this is vital to keeping the body and tires of your car in good shape. Brake dust removed from your tires and rims can be caught in the brush and can scratch the paint on the body of your car. Choose a brush that contours to the shape of the tire, allowing you to cover the entire surface of the tire and remove any grime. A firmer brush is best to scrub any layers of grime away. Using the right type of brush can keep your tires and rims clean and prevent you from damaging other parts of your car unintentionally. Taking care of the quality of your tires and rims doesn’t have to stress you out. The team at CarRegistrationAdvisors.org understands that there are so many different cleansers that it may be difficult to choose what works best. It may be best to use a cleanser that is intended for tires and rims. You can use this cleanser to scrub the tires and the rims to get the entire surface taken care of without worrying about using different products. The experts at CarRegistrationAdvisors.org recommend rinsing the rims before doing any scrubbing. This can remove excess dirt and grime before you use any product. It may be a good idea to wash your car after scrubbing the tires and rims to remove any excess chemicals from the surface of your car. Note that these harsh chemicals can fade the paintjob of your car. If your wheels haven’t been scrubbed in some time, they may require some extra effort. You may need to invest in a higher-concentrated cleanser. 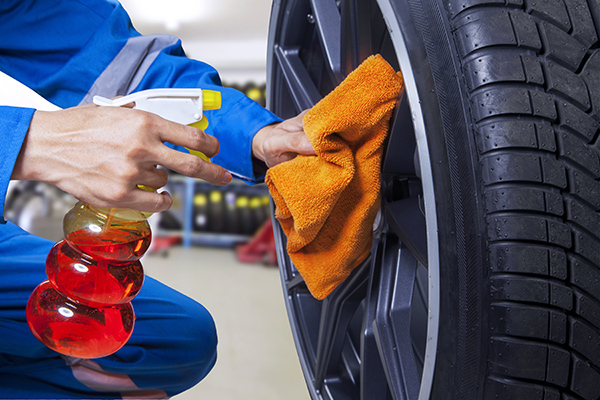 If you want your tires and rims to have more shine, it may require you to simply repeat the cleansing process. There are special brake dust cleansers available if you want to have added protection against grime. Make sure to have numerous rags on hand, and don’t be afraid to apply some extra elbow grease to achieve the shine you seek.